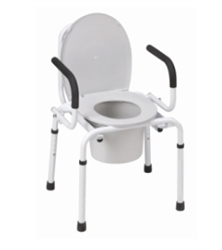 DMI Drop Arm Steel Commode is an easy to use commode with pull-pin release mechanism that drops the padded support arms. It has a weight capacity of 250-pounds. It is constructed of 1” diameter, white powder-coated steel frame tubing for superior weight support. It features slip resistant rubber tips on the end of the legs to provide additional safety. Comes with an 8 quart capacity pail, lid and splash guard.